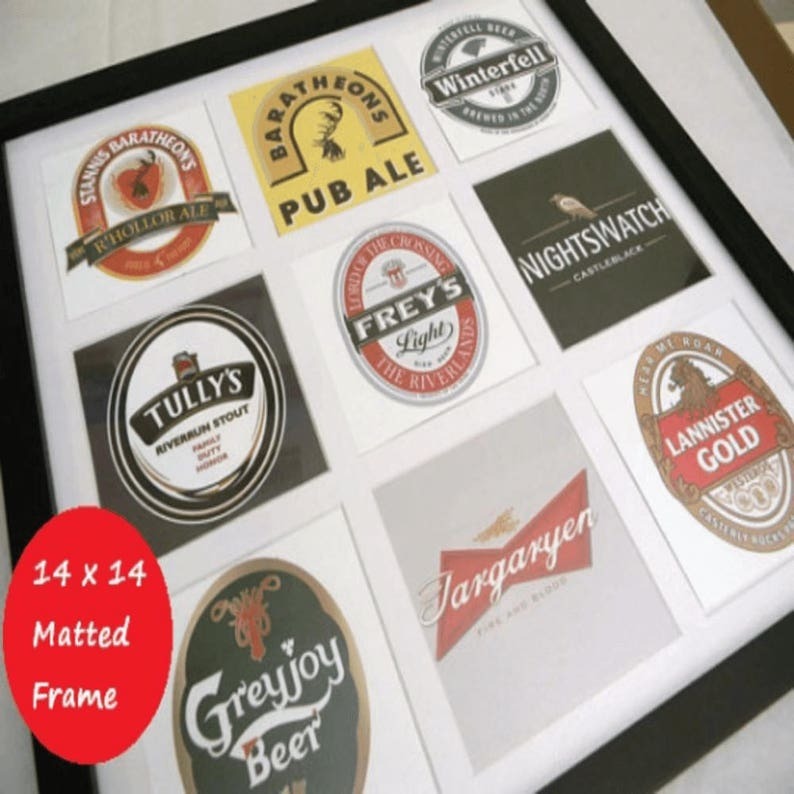 Game of Thrones Art, Game of Thrones Gift, Game of Thrones Beer, Winterfell,Targaryen,Lannister,Baratheon,Stannis,Greyjoy,Nightswatch in a 14 x 14 frame. The beer logos are 4 x 4 with a matte border around all nine Game of Thrones beer logos to give it a very professional look. This Game of Thrones beer logo collage would look great in any house, man cave, bachelor pad, restaurant, or bar. I print all of the Game of Thrones beer logos on premium advanced glossy photo paper, and use only OEM ink to bring out the most vibrant colors, and intricate details of the beer logos to achieve the best quality logos for the beer logos so your Game of Thrones art will look very professional as it hangs on any wall. Trendycoasters truly believes that every one of our customers Game of Thrones wall art purchases will bring joy, happiness, and lasting memories every time they enjoy a beer, and look at this hanging on the wall. We believe it so much that we offer a 100% satisfaction guarantee, or your money back. Check out our reviews, and see how happy our customers really are with their Game of Thrones wall art, coasters, and beer labels. So great for the kitchen or bar area! If your a GoT fan you need this! Love! Love! Love! I received my order within 3-5 days of placing my order. I plan to order from him again!